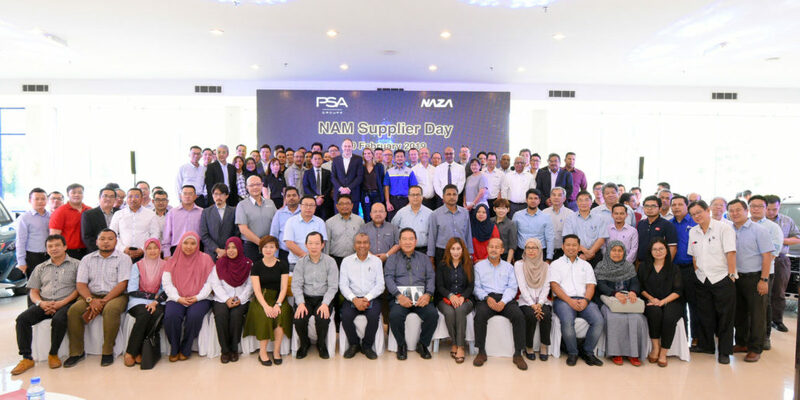 On 20th February 2019, Groupe PSA and Naza Automotive Manufacturing Sdn Bhd (NAM) held its first Supplier Day event in Gurun Plant located at Kedah Darul Aman, northwestern part of Peninsular Malaysia. The response to this Supplier Day was overwhelming with 140 representatives from the industry suppliers, global industry experts and government authorities nationwide attending this event. Within the framework in accelerating Groupe PSA’s development in the Region, Laurence NOEL, CEO & Director of the Board of NAM, ASEAN Senior Vice President, took the opportunity to present Groupe PSA’s Southeast Asia Push to Pass strategy and ambitions in terms of products, operations, local integration and the role of NAM in the ambitions to become a major player in the Malaysian automotive industry. Yann MARTIN, Senior Vice President, Head of Vehicle and Powertrain Procurement for Groupe PSA, has prompted the guests on the purchasing power of Groupe PSA, expectations in term of localization, new business opportunities but also the potential benefits to be part of Groupe PSA worldwide supplier network. NAM aims to launch the first models in April 2019, planned in its agile roadmap to cater for Malaysian domestic and Southeast Asia export markets. In this dynamic and strategic region, two new models based on EMP2 and CMP platforms, produced in our very own Gurun Plant are expected to be launched every year in the future.